When it starts to rain many hunters pack up and head home but for those hunters that stick it out deer hunting in the rain can be very productive. A few years ago I snuck out of the office a little early on a Friday and ran over to a small 12 acre plot of woods close to my home just outside of the city limits. Work was really busy this particular early September but I hadn't been out bow hunting yet this year and we had some weekend commitments already so I new if I didn't take the chance to hunt I wouldn't get out for a while. It was a dark and calm overcast day and you could tell that a storm was on it's way in. I snuck into my stand and got settled in. About a half hour later it started to rain. Not just a little drizzle but a full on down pour soaking me to the bone. As I sat in my stand cold and wet I begun to think about all I could have got done if I stayed at the office and how stupid of me it was to sit in a tree in the rain but for some reason I was to dumb to climb down. After about twenty minutes of heavy rain the weather broke and a light mist started to fall. I was already wet and with less then a half hour worth of daylight I decided to stick it out. A few minutes after the heavy rain quit a nice doe came down the trail and stopped 20 yards from my stand. This particular season the state of Wisconsin had mandated a earn a buck requirement in my area so I drew my bow and rested my 20 yard pin on her vitals. As I released the wet bow twisted in my hand and flew just over her back sending her running for cover. Now I was really upset because as she ran off she took the nice 10 pointer right behind her with the huge brow tines with her. All I could think about was how dumb I was to be out in the rain and how much I had to do at the office. I re notched a arrow and sat down to stew. Not five minutes latter the doe and buck were back. Apparently with the rain they didn't spot me or couldn't tell where the shot had come from. The doe came right back to the same spot and stopped. (By the way, if you've read any of my articles on deer scent you will know I always put a few drops of doe pee in my shooting lanes to stop deer and in this case even in the rain it worked great) This time I didn't miss. The doe dropped like a stone into a 5 foot ravine next to the trail. The buck, still not able to determine my position, ran off about 20 yards and stopped looking around. I notched another arrow and then stat totally still. This high tined monster stood for about 4 minutes about 40 yards out in some heavy cover and then came right back in to the spot were I shot the doe and seemed to be looking for her. He paused just long enough for me to drive a arrow through the kill zone. Needless to say as I climbed down from my stand I forgot all about being wet and all the things I needed to do at the office. Like I said, deer hunting in the rain is great! It is a well known fact that deer activity seems to intensify before or after a big storm. Just like people deer seek out shelter when heavy rain and snow are coming down but in his hunters opinion light rain doesn't seem to effect deer movements as long as the wind isn't wiping, and light rain can have some big advantages for the hunter. When the ground is wet in the woods it is much easier for the hunter to move quietly. after a good rain the leaves on the forest floor don't crunch and crackle like they do on a dry day. Scent doesn't seem to carry as far on a rainy day. As a general rule of thumb as long as it isn't pouring buckets and the wind isn't blowing to hard deer still move around in the rain. So next time it is a rainy day consider grabbing your bow and head for the woods. With today's new rain gear you can remain dry while whitetail hunting in the rain. It’s important to stay more comfortable than the deer, however. Gore-Tex and other companies make exceptional waterproof gear that our forefathers would give their left trigger finger for. There are pants, jackets, hats, boots, and gloves. There is simply no reason to not be bone dry. A lot of hunters like to utilize ground blinds during rainy day hunts for shelter. That is certainly one of the big advantages, but tree stand umbrellas and canopies are very affordable and allow you to continue hunting your favorite stand. Fall arrest systems should always be worn, but extra attention needs to be used in the rain. Your ladder and platform could get slick when wet. I like to punch a few small holes in a piece of carpet and zip tie it to the platform grating. This quiets a stand down and provides a little extra grip in the rain. Grip taping your ladder steps also helps. Both of these things should be done to improve your stand before the season. Moving through the woods becomes much easier in the rain. Crunchy, dry leaves become wet rags in the rain. Keep in mind, deer can move even quieter than they usually do. Napping is not an option for deer hunting in the rain. Don’t even think about “just resting your eyes”. What about scent control? Rain pushes all the dust particles in the air to the ground and settles them. Most of the normal scent of the woods is washed to the ground. Since all the stray scent is gone, new scent is easier to detect under most circumstances. Focusing on the wind, taking good approaches to and from your stand site, and a good scent control plan are more important than ever during the rain. Rubber boots will not only control your scent, but will keep your feet dry when trudging through mud and puddles. Rain doesn’t just wash away scent. 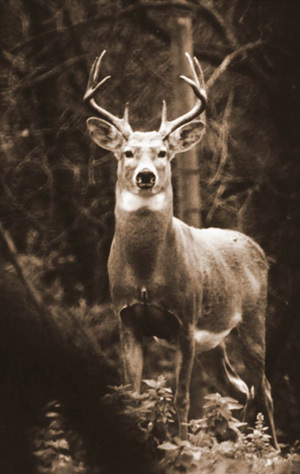 One of the greatest tools in a hunter’s arsenal for tracking deer is blood. Rain washes away blood trails making tracking a tough chore. I advise only close, clean shots while hunting in the rain. If your usual maximum range is 40 yards, I’d pull it down to 25 yards. One mistake that I hear of way too often is getting on the trail too fast. Hunters know their blood trail won’t last long, so they start tracking right away and bump the buck into the next county. Put a good shot on the deer and wait it out. Visually mark the last place you saw him and make a mental note of the spot. If the deer is well hit, it won’t go very far before laying down. Give it time and when you decide to begin tracking, start from the last point and make concentric circles out from there until you find the deer. If the blood trail appears to be washed away, look under the leaves of woodland foliage. The underside of weeds are sheltered and you can often find blood there. If you gave the deer enough time and put a good shot on him, he won’t be far. Need another reason to hunt in the rain? Leading whitetail deer researcher Leonard Rue III says that rain helps dissipate human odor molecules making it harder for a deer to smell you! Rain also makes it easier for you to walk quietly in the woods so.... Less scent and no noise... what's a guy to do??? Try a stalk or walk and stop type of hunt. You may just walk right up on a trophy deer.